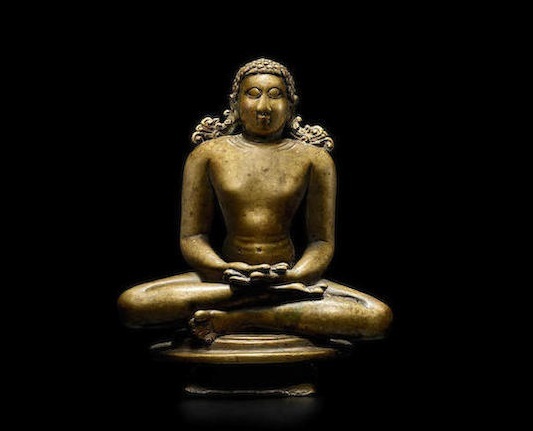 As discussed by Dr. Pal, this charismatic Indian bronze is powerfully modeled and enhances the characteristic simplicity of figure in Jain sculpture with delectable moments of artistic flair. The Jina is unadorned, but a lotus blooms from his crown-chakra, seen from above. The first of the twenty-four Jain saviors, Rishabhanatha (also known as Adinatha, 'Lord of the Beginning'), is one of two Jinas that can be identified without any associated emblems, in his case, solely by long tresses by his shoulders. Here they are cast with a special flourish, like the resplendent tail of a kinnara. Devotees locate the origin of Rishabhanatha to millions of years ago, near the start of our current time cycle, where in addition to enacting the standard career of a Tirthankara, he introduced a variety of practical and social skills to human beings (Granoff (ed. ), Victorious Ones, New York, 2009, p.21). The sculptor has afforded Adinatha long, slender legs to widen his bronze's proportions and better instill its resounding presence. Elsewhere the bronze is able to retain its audience's lingering gaze with wide, entrancing eyes, a broad nose, high cheekbones, broad shoulders, a prana-filled chest, and an appealingly nourished waist indicating a healthy and satisfied diet. The Jina's hands and feet are consummately modeled with the larger toes flexed at different angles, and the bottom foot negotiating the weight of his shin against the stepped platform below. His upraised palm is rendered with a leathery naturalism, and the artist's efforts to delineate each digit speak to his pursuit of detail. Produced in the Deccan during the Western Ganga period, the bronze is a fine example of a very rare corpus of sculptures. With their capital at Talakad, the Western Ganga dynasty controlled much of the Deccan plateau from the 4th century until their subjugation by the Cholas in 1004. Jain Digambara communities flourished and were pivotal supporters of their rule. Western Ganga and later Chola standing Jinas are more common, and they closely resemble one another. The latter typically have less lustrous and less variegated alloys, rounder faces, and less striking eyes than the present lot (cf., Pal, The Elegant Image, New Orleans, 2011, pp.105-6, figs.7-8; Pal, The Peaceful Liberators, Los Angeles, 1995, p.161, no.47B; also Christie's, New York, 20 March 2012, lot 59.). Pal, The Elegant Image: Bronzes from the Indian Subcontinent in the Siddharth K. Bhansali Collection, New Orleans, 2011, p.104, fig.6.